New book, 128 pages, SS34006. The keel of the 35,000-ton battleship Alabama was laid in Norfolk Naval Shipyard in 1940. Laborers swarmed to build the immense vessel as war raged elsewhere in the globe. After the Japanese attack on Pearl Harbor, their work took on new urgency, and the mighty battleship was placed in commission on 16 August 1942. Her first duties included bolstering the British Home Fleet, to protect convoys from such famed German surface raiders as Tirpitz, Scharnhorst and Admiral Scheer. 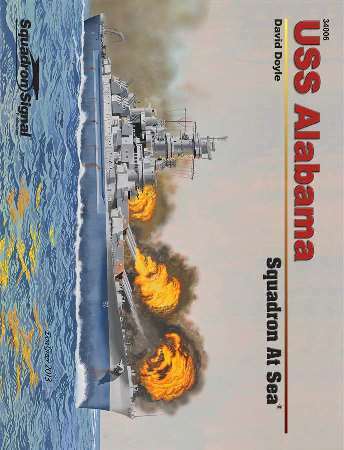 By late 1943 Alabama was operating with the US fleet in the Pacific, her powerful antiaircraft battery, which was frequently augmented, putting up a shield over US carriers and her 16-inch guns firing on Japanese shore positions. This book documents all of these events through more than 200 vintage photos, illustrating these actions, as well as her construction and frequent refitting, before concluding with coverage of her years in the Navy's 'mothball fleet' and the saga of her preservation as a memorial. The extensive array of archival photos is augmented by detailed line drawings and color profiles illustrating her varied camouflage schemes. Illustrated with 285 photographs, detailed line drawings and color profiles.